Karen Gene Rubright, 77, died Sunday, March 17, 2019 at home after a long struggle with heart and lung disease. Funeral Services will be Friday at 12:00 pm at First Presbyterian Church in Iowa City with Rev. Sam Massey officiating. Visitation will be Thursday from 5:00 to 7:00 pm at Lensing’s Oak Hill, 210 Holiday Road, in Coralville. Visitation will also be held Friday morning at the church after 11:00 am. Private burial will follow at Oakland Cemetery in Iowa City. In lieu of flowers and plants, memorials may be directed to the Karen G. Rubright Memorial Fund. Karen Gene Richardson was born on July 1, 1941 in Davenport, Iowa. She was the daughter of Eugene H. and Margery M. (Riley) Richardson. She attended elementary, junior high and senior high in Davenport. 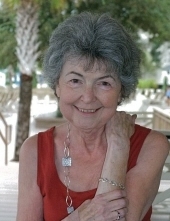 Karen graduated from the University of Iowa in 1963 with a degree in Elementary Education. She began her teaching career at Mark Twain Elementary School in Iowa City in January 1963. In June of 1964 she and her husband, David Diehl, moved to Norfolk, Virginia. She taught school in Norfolk for two years at Larchmont Elementary. They then moved to Rockville, Maryland where she taught in the Montgomery County School District for one year. In 1967 they moved to Davenport, Iowa where she taught school in the Pleasant Valley School District for two years. In 1969 their son, Mark D. Diehl, was born. Karen stayed home for six years to care for him. During this time Karen earned her pilot’s license. In 1974 Karen and Mark moved to Iowa City. For the next ten years Karen taught sixth grade at Grant Wood Elementary School. She was awarded a Master of Arts degree in Educational Administration from the University of Iowa College of Education in 1990. Karen began teaching in the Iowa City Community School District’s Extended Learning Program from 1985 until retirement in 2003. In 1993, Kalamazoo County, Wisconsin awarded Karen the Significant Educator Award for works with gifted students. In July of 1999 she earned the state of Iowa K - 12 Talented and Gifted endorsement. Karen retired in June of 2003. In July of 2003 Karen married William C. Rubright. Karen is survived by her loving husband, William; her son and his wife, Mark and Jennifer Diehl, and their remarkable granddaughter, Myra Diehl of Cape Elizabeth, Maine; Karen’s sister, Deborah J. Doolittle Campbell, and her husband, Dean Campbell of Corona Del Mar, California; step-son, David C. Rubright of Solon and step-daughter, Diane M. Rubright of St. Paul, Minnesota. Karen was preceded in death by her parents; her stepfather, Wayne Doolittle; her sister, Candace Bellamy; and her second husband, Jerry Zaiser. To send flowers or a remembrance gift to the family of Karen G. Rubright, please visit our Tribute Store. "Email Address" would like to share the life celebration of Karen G. Rubright. Click on the "link" to go to share a favorite memory or leave a condolence message for the family.